The Creative Princess: Summer Fun Pinterest PARTY! So, last week you guys remember me talking about all the FUN we had during the weekend with Nestle and Tombstone celebrating summer......right? If not, or if you are reading for the first time (welcome! ), you can find that fun post here. We had a BLAST! I love doing FUN things during the summer with my girlies and am always looking for new ways to break the boredom. I am SO excited to tell you about an AWESOME party we are hosting on Pinterest! Join the #GrabSummerFun Pinterest Party from June 15, 2012 - July 2, 2012. We are giving away a year's worth of Tombstone Pizza! 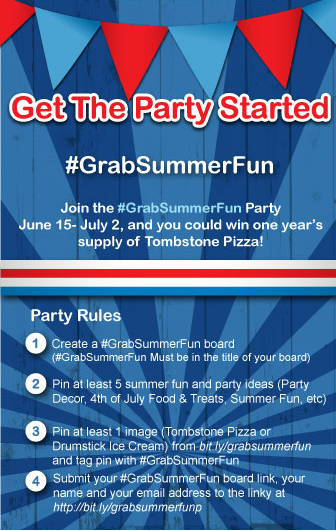 Come back and submit your name, email address and your #GrabSummerFun Pinterest Board link to bit.ly/grabsummerfunp. That's IT! I can't wait to see all the fun things you guys pin!